On the March Labour Day long weekend, Craig and I took the kids for a short 4 day break to Airlie Beach. 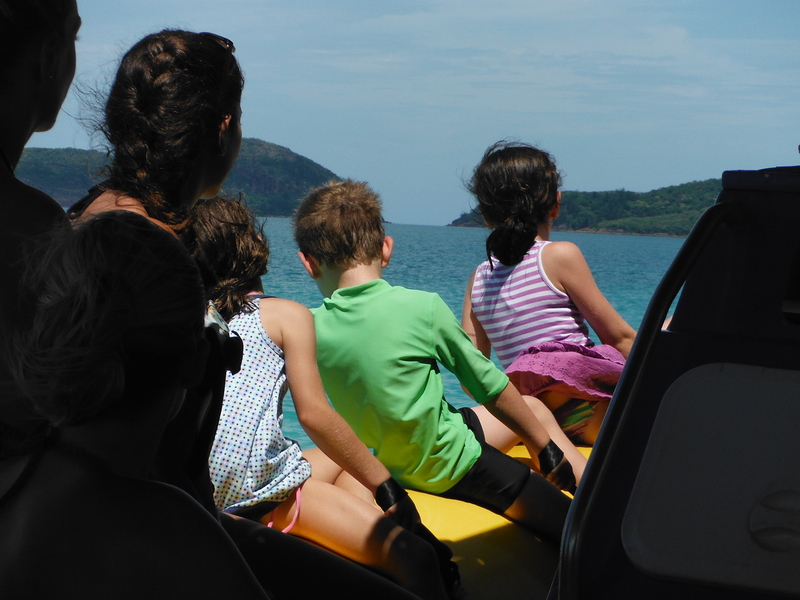 There are so many things to do at Airlie Beach but I was certain of one, I wanted to take the kids to Whitehaven Beach. Nearly 30 years ago I promised someone very special who has since passed away that I would get there one day and now I have done it with my family. It was very special and more than just a tick off my bucket list. 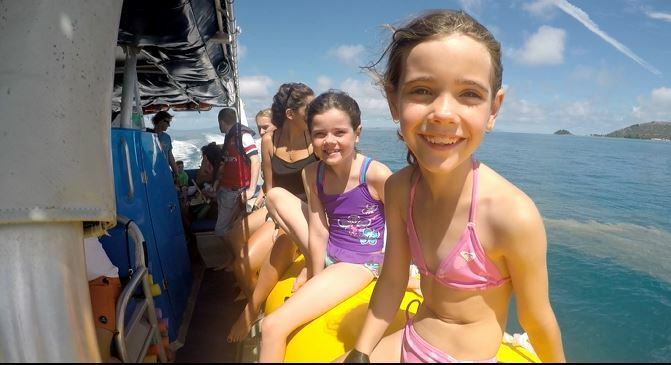 There are loads of different tour companies operating out of Airlie Beach and it’s a bit overwhelming going through them all trying to decide which one was best for us. I finally decided that Ocean Rafting’s Southern Tour best suited what I wanted to do and see. The cost for all 5 of us was $526AUD with buffet lunch included and because we booked straight with the company we got the stinger suits thrown in for free as with snorkel gear. This is a pretty reasonable price for activities in the area. Airlie Beach is only the bottom tip of the Great Barrier Reef, it stretches nearly the whole length of Queensland finishing up past Port Douglas, another amazing place to visit if you want to see a different part of the reef. I have only been up that part once and would love to return with the kids. Our inflatable Ocean Rafting vessel. As we were staying on the main street at Nomad’s Backpackers, it was just a quick 50m walk up to the transfer pick up point. As usual I was in control of booking and organising all the tours. Pick up time was set for 9am but for some reason I had it in my head that we were being picked up at 10am. Luckily enough I had a funny feeling that I might have been wrong so I gave Ocean Rafting a call at 8.50am just to check. Panic stations! Craig and the kids were out having breakfast and he hadn’t taken his phone. I was panicking and couldn’t think straight, how would I contact them. I threw on my closest clothes and went to run out the door to find them. Luckily enough, they were just at the bottom of the stairs about to come up to the room. We had 15 mins max to get down the road. We rushed and packed our bag, threw our bathers on and bolted out the door. I didn’t have enough time to take some seasick medication so we all had to wing it. All 5 us must have looked a treat running like crazy people through the hostel and down the road in the stinking heat in my thongs and bathers! After all the panic we weren’t even the last people to arrive, bugger could have taken those seasick tablets! I’ll pay for that later! The bus took us down to Abell Point Marina North to register our details and get our stingers suits before heading out for the day. The kids were beyond excited. My sister had bought them snorkel sets for Christmas so we had been practising with the snorkel and fins in the backyard in a small 3x3m pool. I was worried they were going to freak out when it was time to snorkel in the ocean. Its one thing to snorkel around a pool and then stand up and get out but this would be different, off the back of a boat into the ocean where they would be unable to stand up! We boarded the boat and headed out about 10am. We headed straight to the back of the boat and spread ourselves out. We brought the kids snorkels from home so that they weren’t stressing about their gear and hopefully we would be able to jump straight in after they put their life jackets on. Wishful thinking I should know better than to think that anything would be a breeze when there is 3 to organise! We took up almost all the back of the boat. There were about 25 tourists on the boat and we were the only family, the rest consisted of young foreign backpackers and a few Aussie couples. The kids were in their element with all the attention focused on them. A few of the backpackers took the time to interact with kids and they loved every minute of it. The girls wanted to be just like the backpackers and get around in their bikini’s without their dresses on. I was stressing because I didn’t have enough sunscreen on them as I thought they would have the stinger suits on! We headed straight out towards Hayman Island and made a brief stop at the sandy cay where Lara Bingle filmed the controversial ‘Where the bloody hell are you’ advert. Regardless of the advert and Lara Bingle… the cay was beautiful, right across from Hayman Island. We didn’t get off the boat but there were a few people out walking on it. We then headed off to Manta Ray Bay on the far side of Hook Island, that area was already taken so we headed down to the next bay. The idea was that we would have a drift snorkel from one beach to another about 200 metres away. Ivan, who was in charge of our boat, said that he would pick up the others then come back and get us and the kids so that we didn’t have to rush. They also dropped us at the beach to make it a bit easier for the kids so that they could get their bearings rather than straight off the back of the boat. Its the small things that other people do that help a lot when you are travelling with 3 small kids. 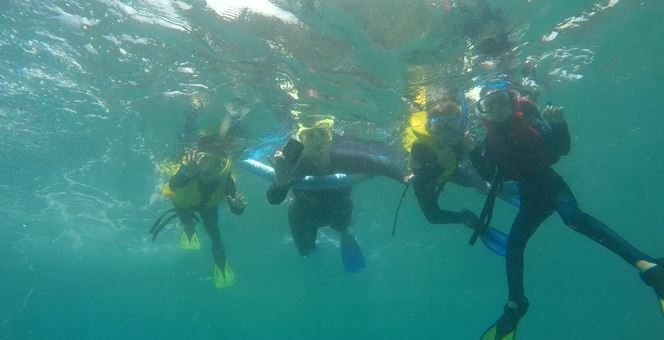 Family snorkelling shot minus dad! We got off the boat straight onto the beach. The others pretty much took off but it took us a bit to get organised. Keira had a problem with her mask being too tight but with a bit of help from Ivan and his offsider Matt we finally got her sorted and the kids were off! They were amazing, like 3 little mermaids! I could hear Alannah squealing in the snorkel every time she saw a fish! I always said that child could talk underwater! I can’t believe how well they did, I hardly had to help them. They knew which direction to go in and off they went, this of course made it a bit difficult to get the photos I wanted though. Craig was busy with the new GoPro and we got some great footage on that. My little champion, only 6 years old. Now remember when I said I would pay later…….! Yep, 30 mins in the ocean bobbing up and down and I was close to being sick. I have worked out now that when I go snorkelling I need seasickness tablets for the water and not so much for the boat. Put that in the memory bank for next time! Luckily we only snorkelled for 45mins and once I was back on the boat I was good to go again. 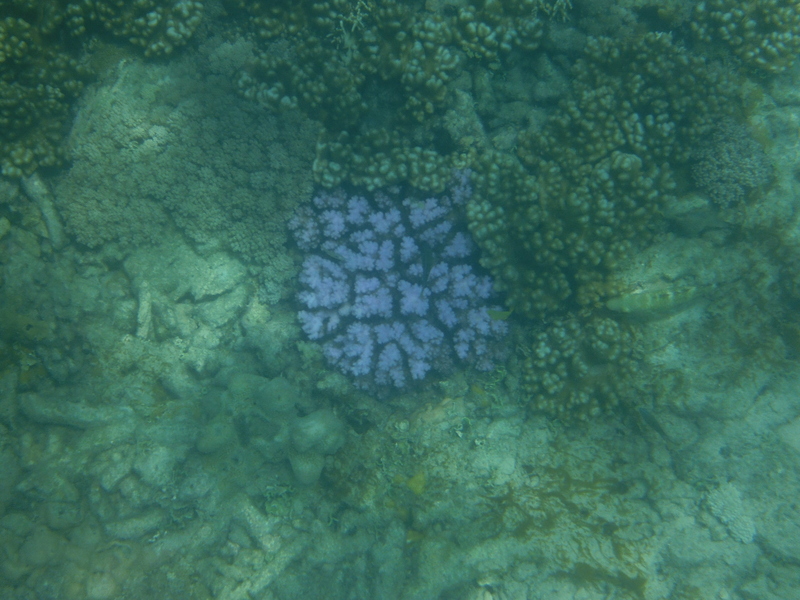 Some beautiful colourful coral near Whitehaven Beach. Next we headed around Hook Island and onto Whitsunday Island to complete the Hill Inlet walk which looks out over Whitehaven Beach. We approached it from the Tongue Bay side of the point so that the first view of Whitehaven Beach was from the top of Hill Inlet and it was breath taking. I have seen Whitehaven Beach in so many travel brochures and it was every bit as beautiful as every photo I have ever seen. The tide was in so the water covered the whole beach but it had swirling blues of various shades depending on how deep the water was in particular areas. It was busy at the top and I felt I could have had a bit more time there as the 25 photos I took just weren’t quite enough! I was so overwhelmed with the beauty of the place, I don’t even think I stopped to ask the kids what they thought… Bad mummy! 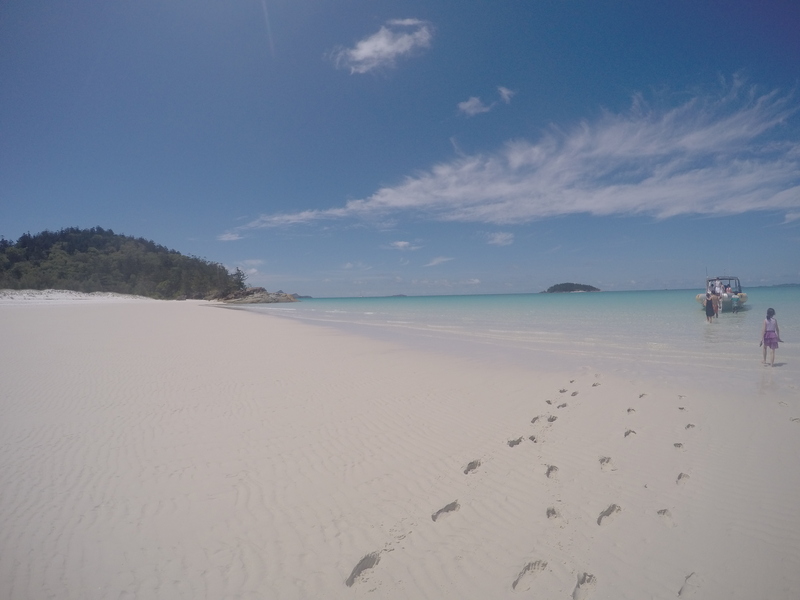 No words – Whitehaven Beach, Queensland! The boat had gone around the point and parked on Betty’s Beach so we all walked down to get back aboard. The photos from down on the beach are nearly as beautiful as the photos from The lookout. Its pristine white sand for as far as the eye can see and when you walk on it, it squeaks! Regardless of what they tell you, the sand does get hot, very hot. The water was crystal clear and at least 28 degrees, you could see little fish swimming around your feet. Do we really have to go! Back on the boat, this time down to the south end of Whitehaven for a buffet lunch on the beach. We had a chicken and salad lunch with a soft drink. We had about 2 hours here to have lunch and then go for a swim in the pristine warm tropical water. 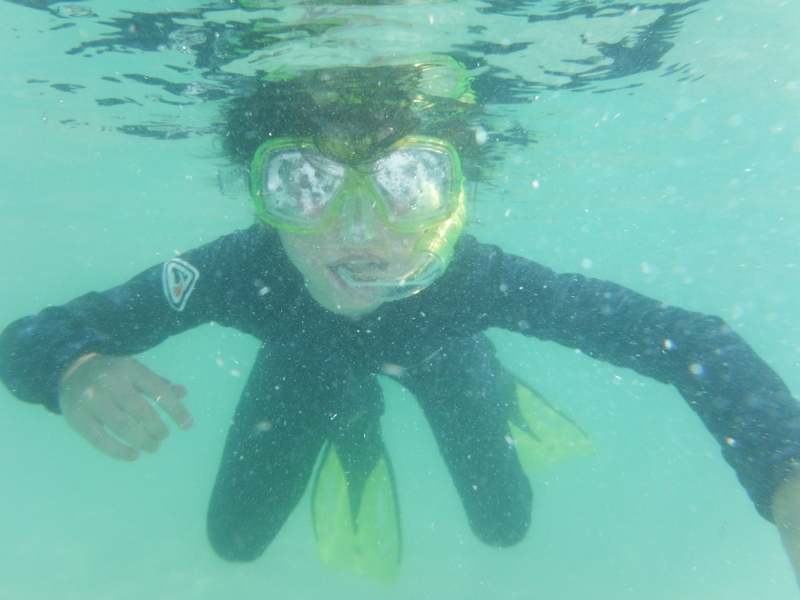 We had to put our stinger suits back on though and the kids had another snorkel. One of the guys in our group went out a little further off shore and swam with turtles, that’s right, not 1 but 2 turtles. I was so jealous. Craig and the girls went out to see if they could find the turtles but they weren’t successful. We did see turtles swimming in the ocean from the boat though so that was nice. 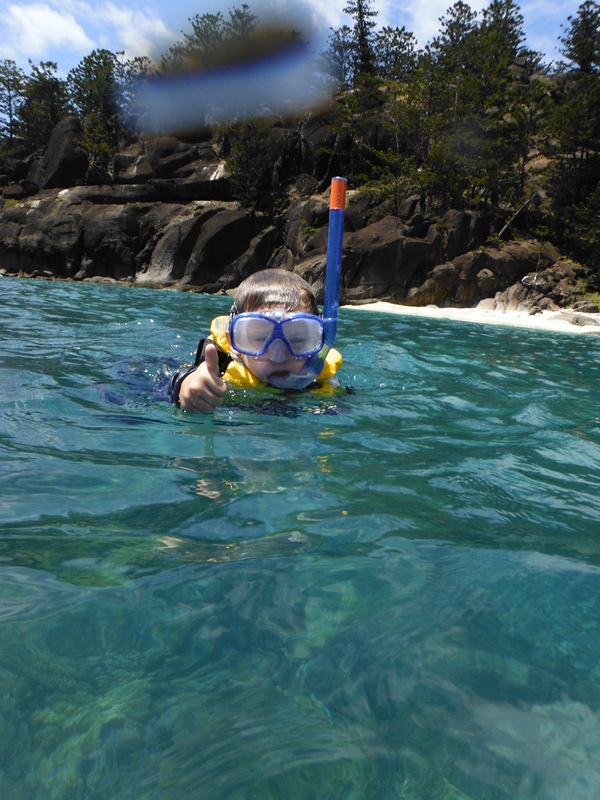 Alannah snorkelling, she loved every minute of it. They went out far enough and had a lovely time. Caelan was doing his own thing entertaining the backpackers by jumping off the side of the boat into the water. He had a lovely 30 mins jumping in then going back on the boat and jumping off again. A couple of the female backpackers were rating his jumps and he thought that was grand! At 3.15pm it was time to board the boat once again. I was so disappointed that our awesome day was coming to an end. I had been so looking forward to that day and now it was over in the blink of an eye. We piled back on the boat, the kids sitting on the inflatable outside with dad and me with my feet firmly planted down the back of the boat. It took us 40mins to get back to Airlie Beach and we went past Hamilton Island on the way. Hamilton Island is much bigger than I had thought and looked totally luscious. I could go back there any day. The kids loved riding on the inflatable sides of the boat. We got back to Abell Marina and the Ocean Rafting bus took the out of towners first and we had an ice block and waited for the bus to come and get us. We were all a touch sunburnt (not as bad as I thought we were going to be!) so we headed back to our room and had showers and got ready for dinner that night. Not before a couple of quick happy hour beers at the Nomad’s Shed Bar though. What a brilliant day we had with Ocean Rafting, the kids were champions and we had a wonderful time with great company and amazing scenery, I think I will be hard pressed to find a better beach than that one. Whitehaven you truly are breathtakingly beautiful and I am so glad I finally come good on my promise from nearly 30 years ago. 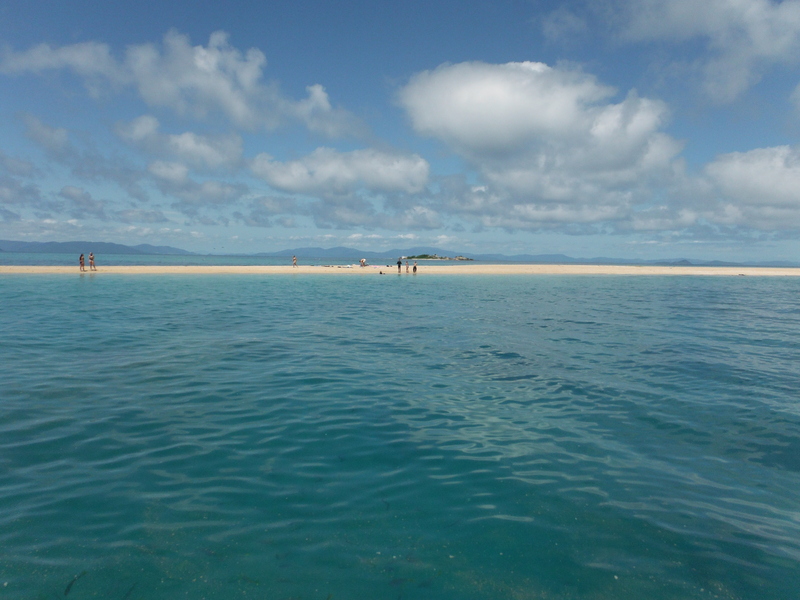 There are so many things to do at the Whitsundays, I could easily spend a month or more there. We visited a secret little gem at Hydeaway Bay, definitely worth a visit if you’re near by. Whitehaven Beach definitely lived up to my expectations, hope to return one day for more snorkelling. Looks fabulous!! That water looks so gorgeous. Thanks Lynda, its just as beautiful as I have always dreamed it would be! Just like all the travel brochures! 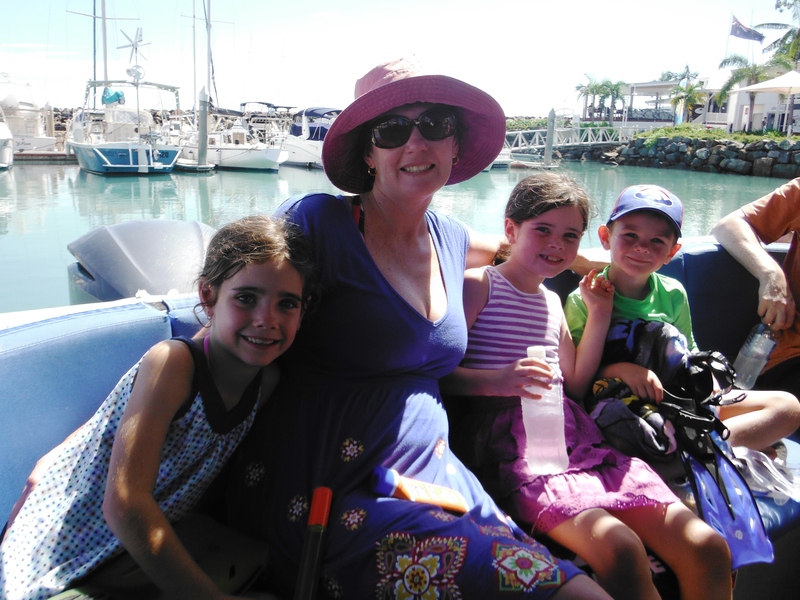 Thanks Whitsundays Tours, glad you like it.